A funeral liturgy for former Lamar resident currently of Pueblo, Colorado will be held at 11:00AM on Tuesday, October 16, 2018 at the Peacock Family Chapel with Deacon Allan Medina reciting. Interment will follow at the Riverside Cemetery. Visitation for Michael will be held from 1:00PM until 5:00PM on Monday, October 15, 2018 at the Peacock Family Chapel. Michael was born on January 25, 1999 at Lamar, Colorado to Anthony Francisco Pacheco and Andrea Martinez and passed away on October 7, 2018 at St. Mary Corwin in Pueblo, Colorado at the age of 19. 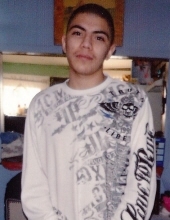 He is preceded in death by his mother, Andrea Martinez and his paternal grandpa, Manuel Gonzales. Michael is survived by his father, Anthony Pacheco of the family home in Pueblo, siblings, Andrew Martinez of Colorado Springs, CO; Makayla Pacheco and Meranda Estep both of Lamar, paternal grandmother, Isabel Pacheco of Lamar, and maternal grandparents, Lydia and Baltazar Martinez of Lamar. He is also survived by numerous aunts, uncles, cousins, other family and a host of friends. Memorial contributions may be made to the Michael Pacheco Memorial Fund in care of the funeral home office. To send flowers or a remembrance gift to the family of Michael C Pacheco, please visit our Tribute Store. "Email Address" would like to share the life celebration of Michael C Pacheco. Click on the "link" to go to share a favorite memory or leave a condolence message for the family.